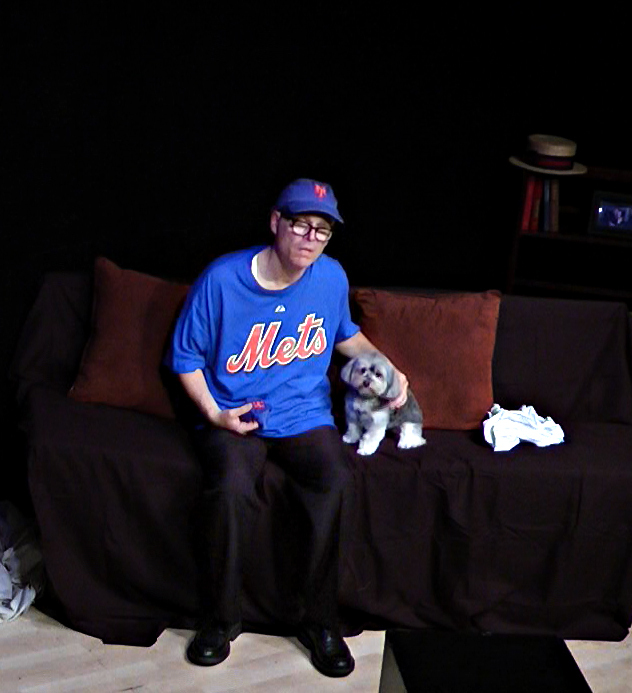 Manhattan Rep’s first ONE MAN / ONE DOG PLAY! What happens when Mom and the kids run away and Dad is left with the Dog? 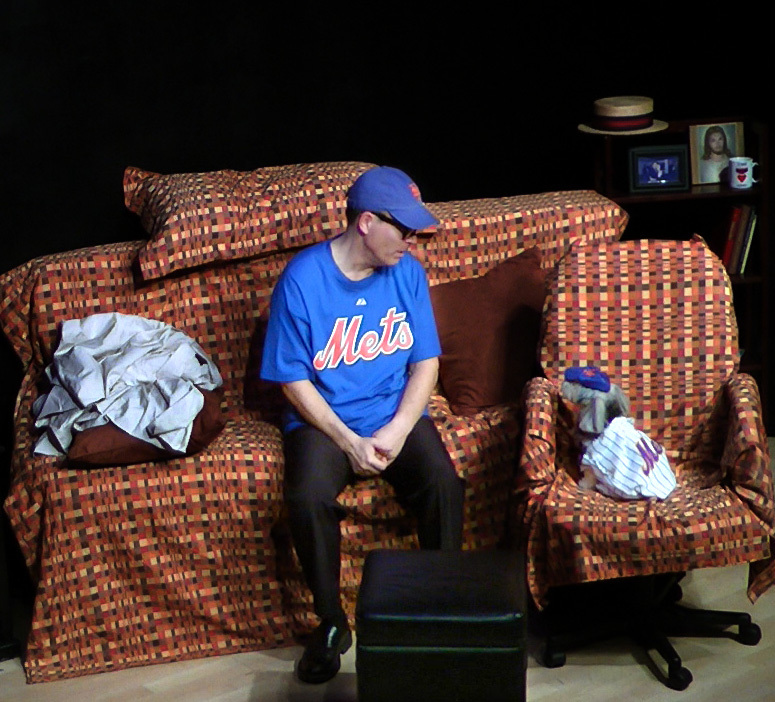 Ken Wolf and Roma Pierro-Wolf star in this amazing new play! The last Ken Wolf play that I saw at Manhattan Repertory Theatre, The People in My Hips, was, I wrote, "unlike any theatre piece I've ever seen before." This is proudly noted by Wolf in his program bio for his new show, Dad and the Dog. Well, lightning has struck twice, for I have REALLY never seen a show like this one before. Nor do I imagine I will see one like it anytime soon. The element that makes this new play authentically unique is the show's star. 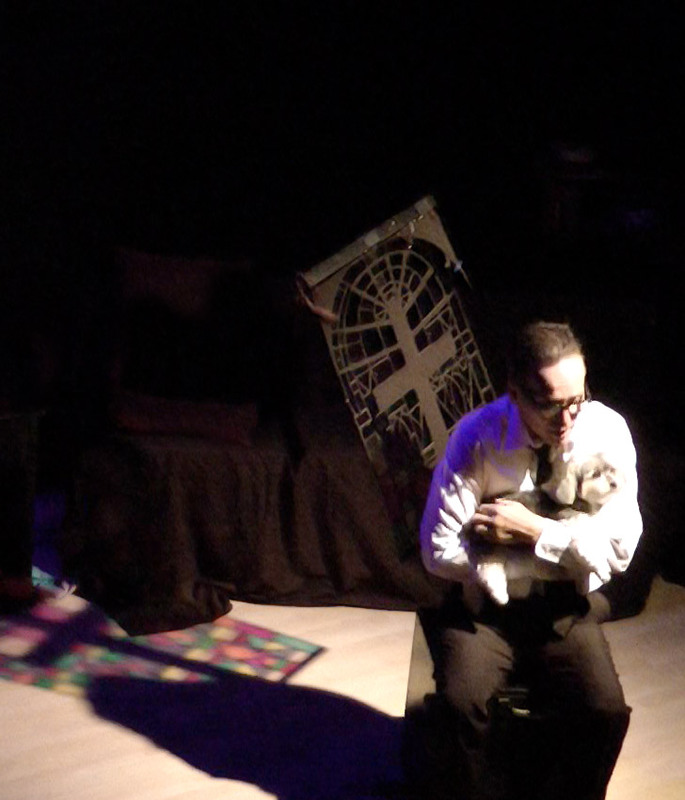 Playwright-actor-director Wolf plays the protagonist, Hank (his Dad). 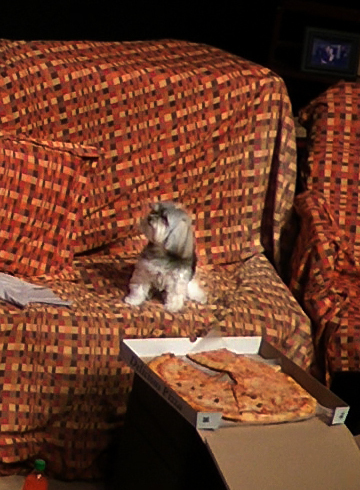 But it is Roma Pierro-Wolf, a charismatic and utterly delightful furry white Morkie, who steals the show, without uttering a single word (or bark) onstage. Basically, all she needs to do is look out at the audience, or gaze adoringly into her co-stars eyes, or sink into a chair on her back demanding that her belly be scratched. She's got everyone in the house in the palm of her... paw. But do not think for one moment that Ms. Pierro-Wolf's presence in this rather bittersweet drama is a gimmick. 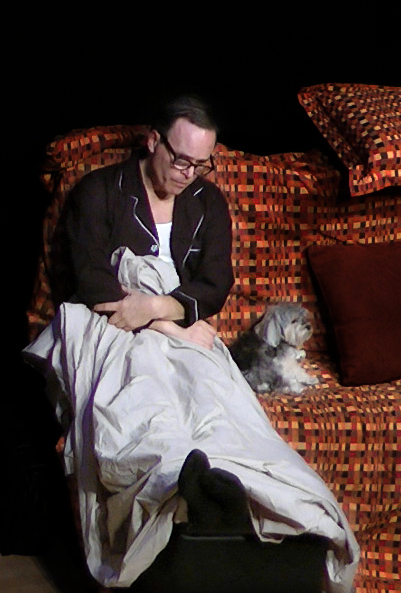 She portrays Missy, who was the Wolf family's dog at the time of the events depicted in this play. And her characterization—and more to the point, her character—is spot-on in this piece. Dad and the Dog is about how a psychically wounded man found solace and then the will to transform himself in the company of a creature who offered him nothing but unconditional love. 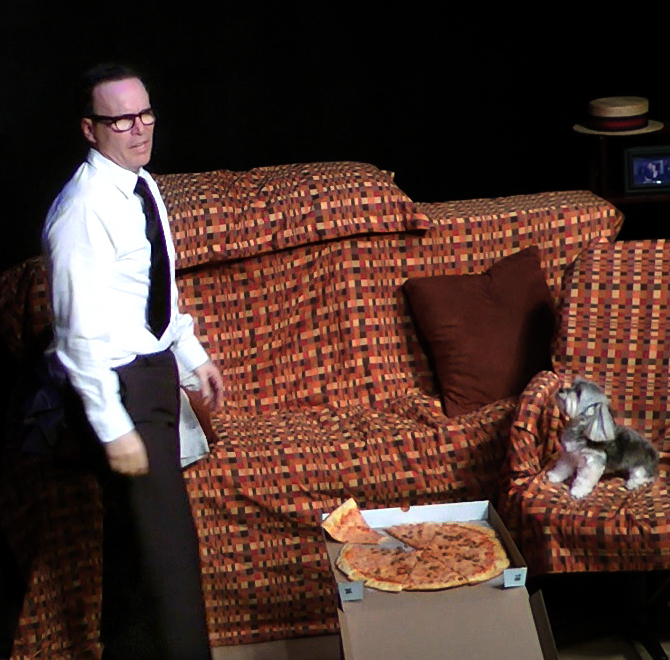 Roma the Dog is onstage for nearly as long as Wolf, not doing tricks or performing practiced acts for a morsel of food, but rather just co-existing with Wolf's character Hank, letting us see what he saw and feel what he felt, as we witness what Wolf describes more than once as a "miracle" take hold of his father and change his life. The play takes place in 1969, when Wolf was 11. That summer, his mother one day suddenly packed up her five kids and all of the family pets EXCEPT Missy and drove off to her parents' home in Pennsylvania. Hank came home from work to discover his house empty except for a dog he had hardly ever interacted with. We eventually learn something about the extreme circumstance that drove Mrs. Wolf and her brood out of Hank's life for those momentous six weeks that summer. But Dad and the Dog is much more about how Hank, with the aid of Missy, healed and reinvented himself. And while it was not only the love of a four-legged friend or the need to care for her that made it all possible, it certainly seems to have had a lot to do with it. Dad and the Dog is sweet, often funny, and quite touching. Wolf's concern for his co-star's comfort and well-being onstage is palpable, which informs the show even as it overloads the actor with more responsibility than we usually encounter. I can only begin to imagine the emotional roller-coaster that performing this play must be for this earnest, hard-working artist. I do think, though, that maybe the billing needs to be switched: thanks to the infinitely cute Ms. Pierro-Wolf, it sure did feel like "Dog and the Dad" to me!